The Dodd–Frank Wall Street Reform and Consumer Protection Act (Pub.L. 111–203, H.R. 4173; commonly referred to as Dodd–Frank) was signed into federal law by President Barack Obama on July 21, 2010. Passed as a response to the Great Recession, it brought the most significant changes to financial regulation in the United States since the regulatory reform that followed the Great Depression. It made changes in the American financial regulatory environment that affect all federal financial regulatory agencies and almost every part of the nation's financial services industry. As with other major financial reforms, a variety of critics have attacked the law, with some arguing it was insufficient to prevent another financial crisis (or more bailouts) and others contending it went too far and unduly restricted financial institutions. President-Elect Donald Trump's transition team has vowed to dismantle the Dodd–Frank act. The House passed a bill to overhaul the 2010 Dodd-Frank financial legislation on Tuesday, sending the bill to President Donald Trump to sign. 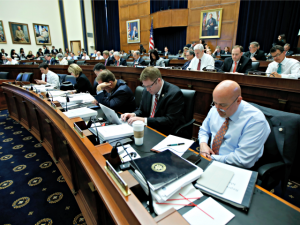 The House passed S. 2155, the Economic Growth, Regulatory Relief, and Consumer Protection Act 258-159, featuring 225 Republicans voting for the bill, 33 Democrats supporting the bill, while most Democrats voted against the legislation. For far too long, far too many people in our country have struggled to make ends meet. They’ve struggled to buy a car; they’ve struggled to buy a home; they’ve struggled for their version of the American Dream. Why is this happening? Because Main Street banks and credit unions that Americans depend on have been stifled by the weight, load, volume, complexity and cost of heavy Washington bureaucratic red tape which has prevented them from serving their communities. But today, that changes. Sen. Mike Crapo and former Trump adviser Gary Cohn settled on less ambitious changes to Dodd-Frank than some Republicans sought. Ten days after his inauguration, President Donald Trump promised to “do a big number” on the Dodd-Frank law that tightened rules on financial firms after the 2008 crisis. Behind the scenes, his then top economic adviser and a powerful senator settled on a less ambitious plan. And in recent weeks, Mr. Trump called a senior House lawmaker, urging him to move forward despite objections from Republicans who wanted broader changes. 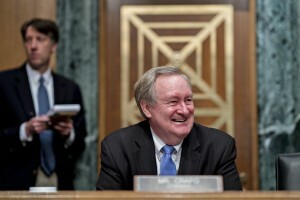 The strategy to seek modest Dodd-Frank changes, agreed to in private by Sen. Mike Crapo (R., Idaho) and former National Economic Council Director Gary Cohn in early 2017, paid dividends on Tuesday: The House of Representatives by 258-159 approved the resulting bipartisan legislation, sending it to the president for his expected signature.